APP LOCALIZATION - WHY IT MATTERS? In this topic, we want to speak about sharing your app on different stores. What’s the purpose? Of course, increasing your revenue and reaching new payable audience. For example, let’s take a look on low-competition markets, such as United Arab Emirates. With nearly 300 million speakers worldwide, Arabic is the fifth most widely spoken language in the world. What's even more intriguing from the point of view of marketing is that many of these speakers are concentrated in highly cash-rich places. Four of the ten the wealthiest countries speak Arabic as the first language - Saudi Arabia, the United Arab Emirates, Qatar, and Brunei. Not only are the populations of these countries the richest, but they have one another great thing that an ordinary app user from America, China or Europe does not have: time. In the most prosperous parts of the Arab countries, rich users also have a lot of free time for their hobbies. Unsurprisingly, the aforementioned Arab states are very valuable for apps and games markets. So, how you will optimize your application for rapturous Arab users? Firstly, you should specify that you do not need to localize the entire application in Arabic. All you need to do is to localize your app's metadata in Arabic. But iTunes Connect doesn't let you add Arabic localization of metadata, how are you going to do this successfully? The answer is really simple. You should change the language in Localization native development region. That will help your app to be seen in any region you need. Try to choose different locations to find out what is the most effective for increasing your apps installs amount. Don’t be scared of testing. Analyze what markets are most profitable for your application. In addition, we are able to help you with our app store optimization. The above strategy optimizes your application for iTunes Connect. What about the possibility of doing the same, for example, on the Polish market? In the world, there are nearly 40 million Polish speakers spread throughout Europe and North America. Also, great language to try is Catalan (the language spoken in the region of Catalonia in Spain, where the richest people in the country live), Romanian, Hungarian and Hebrew. These languages are often overlooked by developers who do not see in the past a lot, although not an exhaustive list of options available in iTunes Connect. As you can see, there is a huge gap in the market that awaits completion. Instead of tries to distinguish yourself by using the same keywords as everyone else in one of the most competitive app stores, you can assign the number one with relative ease to many of the most popular phrases and categories. Nevertheless, you may decide that these markets are less competitive because they are less profitable. This is definitely not the case. 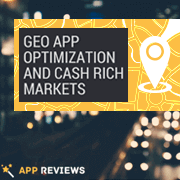 Our website can provide you with all types of services of GEO optimization for your app. This easy trick can increase your average app installs amount up to 42%! In addition, our app reviews applies for any market too. Alternatively, there is another option. You cannot deal with these localization methods. You can try to reach your target audience from another side, just using the US versions of your main keywords at other countries stores. Now you have the opportunity to fill in the metadata input fields in English and Spanish (for example), using keywords when uploading your app to the market. Notwithstanding, the content you publish in these fields does not need to be in any of this languages. In fact, you can fill both metadata fields with keyword-laden English text if you want. This gives you the twice amount of keywords, so you can optimize your content even more effectively. Moreover, our keyword app installs can speed up the whole process twice! So don't lose these great opportunities to improve your app's rank. Our experts always ready to provide you with any professional help and services for your app store optimization. We hope that those tips will be suitable for your application success. All our experience collected here, and if you need more solutions and answers for why your reviews removed from Playstore – just connect with us, and we will bring all we have aboard to solve your problem. See ya on top charts!